Three prominent Maharashtra politicians and noted social worker Anna Hazare have been indicted by an inquiry commission set up to probe corruption charges against them, in according to a report placed the state legislature today. The massive state funding for a private college named after Chaudhury Charan Singh invited censure from ruling alliance partner Rashtriya Lok Dal President Ajit Singh, who disclaimed that the move was to perpetuate the memory of his father. UPA chairperson Sonia Gandhi’s visit to the city tomorrow is mired in a controversy after the TDP questioned her locus standi in the government. The continuance of Syed Sibtey Razi as Governor of Jharkhand appears to be bleak even though an embarrassed Manmohan Singh government has endeavoured to rectify the glaring impropriety involved in the appointment of a minority Chief Minister in the first instance. Angered over the decision of the Congress-led UPA Government to name the proposed airport near Hyderabad after former Prime Minister Rajiv Gandhi instead of former Andhra Pradesh Chief Minister N.T. Rama Rao, the Opposition today forced the adjournment of the Rajya Sabha and staged a walkout. The Gujarat Assembly was thrown into a turmoil today with the House witnessing noisy scenes leading to the suspension of all Congress MLAs for the remaining Budget session. The Delhi High Court has issued notices to the Defence Secretary, Chief of Army Staff and four top officials of the armed forces on a petition filed by a Major-General of the Military Nursing Service, who was prevented from displaying star plate and flying flag on her official vehicle. In a major victory to thousands of Narmada dam oustees, the Supreme Court today ruled that even those affected temporarily by the 110-m high Sardar Sarovar Project on the Narmada would be entitled to alternative cultivable land allotment by the states. Bone defects can now be treated using ‘donor’ bones from the first of it kind cadaver bone bank, set up at the All-India Institute of Medical Sciences. The economic policy of the UPA government came under sharp attack from the Left parties, with the CPI member Gurudas Dasgupta accusing the Centre of following anti-worker policies. The Punjab Government’s efforts to get the support of Centre on the SYL issue got a major jolt as the Centre has declined to accept the riparian principle as a basis to settle inter-state water disputes. Former Prime Minister Atal Bihari Vajpayee today termed as “baseless” the charge that he had misled the nation on the interlinking of rivers in his 2003 Independence Day address. A Mumbai court today issued a bailable warrant against CPM leader Harkishen Singh Surjeet in the defamation case filed against him by actor Anupam Kher. Metropolitan Magistrate C.B. Havelikar issued the warrant against Mr Surjeet for not appearing before the court despite a summons issued against him. 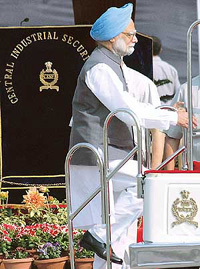 Asserting that an atmosphere of security was paramount for the country’s economic progress, Prime Minister Manmohan Singh appreciated the Central Industrial Security Force’s role in providing security to vital industrial installations in the country. The Tamil Nadu Assembly today witnessed unruly scenes over a remark on former Union Minister Murasoli Maran by Chief Minister J. Jayalalithaa followed by a walkout by DMK and Congress legislators. The Archaeological Survey of India, the Ministry of Cultural Affairs and Janssen Pharmaceutica, Belgium, have signed a memorandum of understanding (MoU) for the maintenance, conservation and preservation of Tipu Sultan’s Palace, Srirangaptnam, and Hampi monuments in Karnataka. The Supreme Court has ruled that horoscope cannot be a reliable evidence for determining the date of birth of a person and that the school records will have more ‘probative value’. The government today declared that it was opposed to any deletion or addition in the National Anthem or its substitution by another composition. The West Bengal Assembly yesterday passed the Gorkha Hill Council Amendment Bill, extending the council’s tenure for another six months after its expiry on March 25 with Mr Ghising on its head. The Delhi High Court today gave three more days to actor-turned-politician Vinod Khanna to vacate his ministerial bungalow in the capital. There was panic for over an hour at the Indira Gandhi International Airport last night after an airliner tyre burst, causing tizzy among security officials. Charangunda village turns tipsy for the annual liquor festival. unofficially for the past several weeks following the resignation of two ministers, Mr Sureshdada Jain and the Nawab Malik. Both ministers and former Industries Minister Padamsinh Patil have been indicted by the commission for corrupt practices. The fourth politician to be probed by the commission, Maharashtra’s Tribal Development Minister, Dr Vijaykumar Gavit, was exonerated. “No corrupt motive can be attributed to Dr Gavit and no instance of corruption has been pointed out against him,” the report said. However, Mr Gavit was criticised for not supervising the actual implementation of the schemes and, therefore, found him guilty of maladministration. The commission castigated Anna Hazare and held him “guilty of corrupt practices and acts of maladministration in the functioning of various organisations and trusts associated with him”. Four institutions and trusts headed by Hazare were investigated by the commission. The Maharashtra government said today that it would set up a special task force to implement the recommendations made by the commission. The task force is to submit its report in three months. However, the opposition Shiv Sena-BJP insisted that criminal action be initiated against the former ministers. The one-man commission was set up after Hazare went on an indefinite fast to seek a probe into the functioning of the ministers. Suresh Jain retaliated by going on a fast at Hazare’s protest venue and demanded that ten institutions headed by the noted social worker be probed. This assertion virtually pulled the rug from under Chief Minister Mulayam Singh Yadav’s feet. While reacting to the opposition’s cut motion last week, Mr Mulayam Singh Yadav had taken the high moral ground by declaring that he would not tolerate any insult to the memory of the great leader of the state, Chaudhury Charan Singh. The RLD President said that any indication being perpetuated by anyone that funds were being doled out to the Etawah college for this purpose was incorrect. The RLD President reiterated what the BJP and the BSP had been pointing it out in the House and by boycotting it for the past two days. While categorically stating that he saw nothing wrong in the Chief Minister establishing a university in Etawah, it should not be done at the cost of the rest of the state being starved of funds, remarked Mr Ajit Singh. Advocating some sort of equilibrium in the allocation of funds, Mr Ajit Singh said there were several other institutions in the state in the name of his late father, Chaudhury Charan Singh, that too required funds. The private college at Hevra in Etawah is in the eye of a storm. Headed by the Chief Minister’s brother and PWD Minister Shivpal Yadav, the college has attracted severe criticism of the combined opposition for a single institution sponging off a major chunk of the higher education budget of the state. BJP MLA from Allahabad Narendra Singh Gaur, who had first raised the issue in the House, said that for the financial year 2003-04 the college had received Rs 69 crore or 97 per cent of the Rs 71 crore higher education budget. The story has been repeated this year with the college set to get Rs 15 crore or more than 50 per cent of Rs 29 crore set aside for higher education. Sonia is arriving here tomorrow for a brief four-hour-long trip during which she will lay the foundation stone for the Rajiv Gandhi International Airport at Shamshabad on the city outskirts. She is also scheduled to inaugurate the National Institute of Tourism and Hospitality Management at Gachibowli, unveil a pylon of the Rajiv Gruhakalpa housing scheme and address a public meeting at Parade Grounds in Secunderabad. The naming of the Rs 1,380 crore greenfield airport after Rajiv Gandhi has triggered political furore with the main opposition TDP raising objections and demanding that it be named after former Chief Minister N.T. Rama Rao. Contending that the Congress Government’s decision to drop the name of NTR, in whose memory the domestic terminal of the existing airport here was christened, amounted to hurting Telugu pride, the TDP announced that it would boycott tomorrow’s function as a mark of protest. “We only wanted NTR’s name to be retained for the domestic terminal as at present. But the Congress is insensitive to the sentiments of the people of the state,” senior TDP leader and former Home Minister T. Devender Goud said. “The TDP is trying to create a controversy where there is none. As and when the present domestic terminal is shifted to the new airport, we can discuss about calling it after NTR,” Mr U. Arun Kumar, a Congress MP, retorted. The TDP also questioned the credentials of Ms Sonia Gandhi to lay the foundation stone for a project like the airport. Congress leaders rebuffed the opposition stand saying that Sonia, being chairperson of the National Advisory Council and the UPA, enjoyed Cabinet rank at the Centre. Though Mr Razi might have some breathing space for the moment, a dominant opinion in the Congress-led UPA government is to make serious amends by recalling the Governor once the controversy dies down now that an NDA government has proven its majority on the floor of the Assembly. Mr Razi, who was in the Capital yesterday and had an informal meeting with Union Home Minister Shivraj Patil, sought to put up a brave front when asked if his gubernatorial assignment is coming to an end prematurely. He tried unconvincingly to nip such speculation in the bud. Nevertheless, several names are doing the rounds as a possible replacement for Mr Razi including that of the topmost civil servant in the country. Though the Jharkhand Governor finds himself delicately placed, efforts are on to accommodate him in some other capacity as a face saving device. Authoritative sources in the Congress did not rule out the possibility of Mr Razi being accommodated in the Rajya Sabha where the numerical strength of the UPA is being sharply eroded. The Manmohan Singh government’s image has been adversely affected and the Prime Minister is emphatic that such aberrations in the democratic process should not be allowed. The UPA has categorically told Parliament that it had no role to play in the actions of the Governor of Jharkhand. In the churning going on in the Congress, Mr Razi is evidently emerging as the fall guy. Simultaneously, the BJP maintained today that it will insist on the recall of Mr Razi as well as Goa Governor S.C. Jamir for their “unconstitutional and undemocratic actions” as the Constitutional head of their respective state. The Governor’s action in inviting a minority combination following a fractured verdict in the Assembly election in Jharkhand, coming close on the heels of the unsavoury developments in Goa where the Manohar Parrikkar government was dismissed, was just the spark required for the Opposition alliance to launch a frontal attack against the Congress-led UPA Government for murdering democracy. Badly pushed to the wall, the UPA government sought to arrest the drift by making course corrections including suggesting to President APJ Kalam that Mr Razi can be called to the Capital for discussions. Thereafter with JMM leader Shibhu Soren being unable to rustle up the numbers, the UPA government advised him to resign so that the Jharkhand Governor could invite the NDA to form the government in Ranchi and fix a time frame for proving their majority in the state Assembly. The Rajya Sabha was adjourned twice for 30 minutes each before the adjournment of the House for the day due to Opposition protests, spearheaded by the TDP. The TDP members, who staged a demonstration near the Mahatma Gandhi statue outside Parliament before both Houses assembled for the day, raised the issue vociferously in both Houses of Parliament. They registered their strong protest against last night’s Cabinet decision to rename the Hyderabad airport after Rajiv Gandhi, while shifting it to Shamshabad, 30 km from Hyderabad. Presently, there are two terminals at the Hyderabad Begumpet Airport, one named after former Andhra Pradesh Chief Minister N.T. Rama Rao (domestic) and the other after Rajiv Gandhi (International). Yesterday’s Cabinet decision meant that ultimately there would be only one airport at Shamshabad and that would be named after Rajiv Gandhi. Earlier, Civil Aviation Minister Praful Patel clarified in the Rajya Sabha that the Rajiv Gandhi Airport was brought into effect by a decision of the Cabinet on August 10, 1992. In 1999, the then Chief Minister Chandrababu Naidu had also wanted it to be named after Rajiv Gandhi. Mr Patel said there was another Cabinet decision on May 18, 1999, stating “the name may be changed to Hyderabad airport from Rajiv Gandhi Airport”. In the Lok Sabha, backed by the opposition benches, TDP members were on their feet as soon as the Lok Sabha assembled, protesting against the government’s “hasty” decision. Pandemonium prevailed in the House when the Congress and ruling BJP MLAs had a verbal duel over the issue of education, following which the Opposition MLAs uprooted mikes and threw at latter. The Speaker then suspended the Opposition members for the remaining Budget session. In-charge speaker Mahendra Mashru suspended the entire Opposition after Parliamentary Affairs Minister Ashok Bhatt moved a motion in this regard, which was seconded by Finance Minister Vaju Vala. The Congress MLAs were accused of ransacking speaker Mangaldas Patel’s office and breaking furniture and glass panels of his cabin. A Bench of Mr Justice B.A. Khan and Mr Justice Anil Kumar asked the respondents to file their reply to the petition filed by Major-General Usha Sikdar by May 16, the next date of hearing. Additional Solicitor-General (ASG) P.P. Malhotra submitted that Military Nursing Service (MNS) Officers were not on a par with Army officers as the former were part of an auxiliary force. As the court wanted to know the difference between the two services, ASG Malhotra said the Centre would file a detailed reply. In her petition filed through counsel P.D.P. 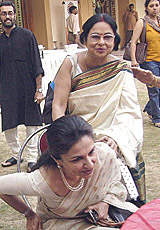 Deo, Ms Sikdar said during her official visit to the INHS Asvini, Mumbai, in August 2003, Surgeon Rear Admiral V.K. Singh (an officer of her rank), disallowed her to display star plate and flag on her official vehicle. She submitted that her representation against Rear Admiral Singh was not acted upon and on the contrary, Adjutant General’s branch of Army headquarters issued her a letter stating nursing officers were not covered under the definition of “officers” as given under Section-3 of the Army Act, 1950. The judgement, given by a three-judge Bench comprising Justice Y.K. Sabharwal, Justice K.G. Balakrishnan and Justice S.B. Sinha, will have a major impact on relief and rehabilitation work carried out by the states before raising the dam height. Though the final height of the dam would be 138 m, the court on a petition filed by the Narmada Bachao Andolan (NBA) had said the height could be raised in phases after completing relief and rehabilitation measures for the affected families. Although the ruling came on an application filed on behalf of the affected families from Pichodi and Jalsindhi villages in Madhya Pradesh through counsel Sanjay Parikh and S. Muralidhar, it will mean that states will have to allot alternative land to those affected by the dam either permanently or temporarily. The court also ruled that each major son of an affected family would be entitled to separate land allotments at alternative sites in addition to the land allotted to these families. Bone defects can now be treated using ‘donor’ bones from the first of it kind cadaver bone bank, set up at the All-India Institute of Medical Sciences (AIIMS). Ruchika, 13, diagnosed with a benign tumour of the left shoulder blade, underwent two operations to remove the growth and the scraped out area was filled with bone grafts, once from her own pelvis and once from her mother. But when the tumour seemed to be growing again, both mother and daughter had insufficient bone for the operation. It was then that the bone bank set up at AIIMS stepped in. “Ruchika underwent a bone graft with the donor bone and today, three years after that surgery, she is healed and absolutely disease free. In fact, she has even featured in several health programmes on TV,” said Dr Rajesh Malhotra, Additional Professor Orthopaedics, AIIMS. Speaking at a press conference, he said, “The bone bank stores bones donated by willing donors or relatives of the deceased and it is stored at minus 80°C in sterile conditions. “These bones can last up to five years when frozen and whenever a case comes up it can be retrieved. There is no ‘tissue matching’ in this case as is required for kidney transplants. The length of the bone is measured using x-ray and accordingly a grafting is decided,” he said. According to Dr Suray Bhan, Head of the Orthopaedics Department, AIIMS, any person in the age of 15 to 75 years can donate bone. Raising the issue in the Lok Sabha, he said employees in different sectors were planning to go on a series of indefinite strike this month against the economic policy of the Centre. As a result of the government’s policies and apathetic attitude towards workers, the country was facing a series of strikes within a span of one week, he said. He wondered whether the people had given this mandate to the UPA when they voted out the BJP led NDA government. The CPI member said more than seven lakh bank employees were scheduled to go on strike on March 22 while GIC employees would take to the same path on March 23 and 24. Court workers in the country and the power workers had also given separate strike calls throughout the nation in support of their various demands during the week. Mr Dasgupta alleged that the government was indifferent to the demands of workers and employees as no Central minister had ever talked to the agitated employees. In a written reply to the Lok Sabha, Union Water Resources Minister Priya Ranjan Dass Munshi said, “ We have no intention to take up those disputes under the riparian principle where the inter-state disputes have already been settled among the state governments,” indicating Centre's non-partisan stand on the inter-state water disputes between Punjab and Haryana, Rajasthan and other neighbouring states. The question was raised by Akali Dal MP Sukhdev Singh Dhindsa, former Union Minister for Chemicals and Fertilisers. Despite repeated attempts from Mr Dhindsa, Mr Munshi declined to offer any assurance in this regard, thus giving an indication that the Centre had no intention to support the Punjab Government, even indirectly, on the controversial Sutlej-Yamuna Link canal. Punjab Chief Minister Amarinder Singh and the Akalis have been claiming that under the riparian principle Rajasthan has no right over the Ravi-Beas water as the state did not fall under the riparian areas of these rivers. About 25 MPs asked supplementary questions regarding the inter-linking of rivers and other inter-state disputes. Congress president Sonia Gandhi was also sitting in the House at that time. She was seen thumping the tables, while Mr Munshi was replying to a spate of supplementary questions. He asserted that he had only stated that work on the two projects would begin with cooperation of state governments by year-end. “Centre’s talks with the Governments of Rajasthan, Madhya Pradesh and Uttar Pradesh had reached an advanced stage. Chief Ministers of other states had also evinced keen interest in the inter-linking of rivers and talks were on for signing a memorandum of understanding. There was a strong possibility of signing the MoUs by the end of the year,” a statement from Mr Vajpayee’s office said, adding that “but they could not be signed keeping in view the Lok Sabha poll and the possibility of the model code coming into force.” However, Mr Vajpayee expressed happiness that the Centre had revived the river inter-linking project. “Better late than never. Though belated, the Congress-led coalition has adopted the policies of the NDA government,” it said. A Mumbai court today issued a bailable warrant against CPM leader Harkishen Singh Surjeet in the defamation case filed against him by actor Anupam Kher. Metropolitan Magistrate C.B. Havelikar issued the warrant against Mr Surjeet for not appearing before the court despite a summons issued against him. Rejecting Mr Surjeet’s plea of ill-health, the court ordered the CPM leader to provide a surety of Rs 10,000 in lieu of the warrant issued against him and asked him to appear in person. Mr Kher had filed a case against Mr Surjeet for calling him an “RSS man” in the Communist Party publication ‘People’s Democracy’. Kher was removed as the Central Board of Film Certification Chairman on October 13. Asserting that an atmosphere of security was paramount for the country’s economic progress, Prime Minister Manmohan Singh appreciated the Central Industrial Security Force’s (CISF) role in providing security to vital industrial installations in the country. “For any nation’s development and progress, security has a special role and for good economic development, an environment of security is immensely important,” Dr Singh said addressing the officers and the jawans of the CISF on the occasion of the force’s 36th Raising Day. Hailing the role of the CISF, he said protection of industries would ensure that all take benefit of the development. The Prime Minister was also appreciative of the sea change the CISF had infused in the airport security. Referring to the 1999 hijacking of an Indian Airlines plane which was on its way to Delhi from Kathmandu, Dr Singh said because of it the nation faced a “big challenge of not allowing repetition of such incidents”. The moment Ms Jayalalithaa remarked that DMK Union Ministers in the Vajpayee Cabinet, the late Mr. Murasoli Maran and Mr. T. R. Balu, had “misbehaved with the police” during the midnight arrest of DMK President M. Karunanidhi in 2001, DMK members were up in arms. Failing to pacify the agitated DMK MLAs, Speaker K. Kalimuthu evicted four of them from the House following which DMK and Congress members staged a walkout. Ms. Jayalithaa even alleged that the two Union Ministers had used their influence at the Centre then and got the three police officials, involved in the arrest, transferred from the state. She said a case filed by the officers against their transfer was still in the court. The memorandum was signed here on Tuesday in the presence of Prince Philipe and Princess Mathilde of Belgium. He said the two sites have been identified for logistical reasons. He said the MoU would be the beginning of a long-term professional association with Janssen and would offer mutual benefits and advantages. Replying to a question, Mr Rajeev said India had nominated Sri Harmander Sahib for world heritage site status. “Horoscope cannot be reliable because it can be prepared at any time to suit the needs of a particular situation. Entries in the school register and admission form regarding date of birth constitute good proof of age,” a Bench of Mr Justice Arijit Pasayat and Mr Justice S.H. Kapadia ruled, while upholding the dismissal of a Patwari by the Punjab Governor for forging the records of his date of birth to get the job 47 years ago. The court, however, said, “Where no other material is available, the horoscope ‘may be considered subject to its authenticity being established’ to determine the age. Punjab Government Patwari, Mohinder Singh, appointed on February 5, 1952, was dismissed from service after it was ‘proved’ in a departmental inquiry in 1985 that he had fudged his date of birth in the school certificate to get the job and later produced his horoscope as the proof of his age. “We are opposed to any addition or deletion,” Home Minister Shivraj Patil told the Lok Sabha during question hour. Replying to another supplementary, he said the government had no plans to amend the Constitution with an aim that no one could tamper with the National Anthem in future. He said the government would contest the writ petition, filed by Mr Sanjeev Bhatnagar seeking an appropriate order/writ of the word “Sindh” from the National Anthem or its substitution by some other proper and approved word like “Kashmir”. Though all anti-Ghising parties in the hills strongly opposed the decision to yield to Mr Ghising’s demand against the appointment of an administrator at the hill council after the expiry of its tenure, Chief Minister, Buddhadeb Bhattacharjee responded to Mr Ghising, possibly to avoid any immediate trouble in Darjeeling during the on-going tourist session. The Chief Minister, however, said he would meet the Prime Minister, Dr Manmohan Singh, in Delhi on Wednesday and discuss about the future action plan at Darjeeling. Justice Gita Mittal ordered the extension of the eviction time till Friday. Meanwhile, she directed the counsel appearing on behalf of the government to visit the newly allotted MP flat and give a status report to the court by March 18. Mr Khanna appeared in person in the court alleging that the newly allotted flat at Purana Qila in the Capital was still grossly underfurnished and inhospitable. Moving to the new flat at this stage when Parliament session was on was not only inconvenient but might pose a danger to his health, besides he is suffering from jaundice, he said. The incident occurred at around 11.30 pm when flight 9W-325 of Jet Airways was heading towards the hanger after disembarking passengers and crew on its arrival from Mumbai. No one was injured during the incident. Immediately, an emergency was declared and CISF quick reaction teams were rushed to the tarmac thinking that the blast could have occurred due to some explosive materials. It was later found that the loud sound was due to tyre blast. The Leader of Opposition and BJP president L.K. Advani may visit Pakistan during the upcoming recess in Parliament Budget session from March 24 to April 18. India has again recalled its Ambassador in Nepal, Mr S. S. Mukherjee, for consultations and he is arriving here tomorrow. Mr Mukherjee will be given fresh instructions by the government after its Nepal strategy is finetuned following discussions with the visiting US Secretary of State Condoleeza Rice.